The lives of thousands hang in the balance. This year alone, 4,000 hens have been gassed and their bodies dumped in landfills because we have been forced to relocate our rescue & adoption program Rescue Ranch. You are desperately needed to change the life of one hen, to liberate her from misery and give her freedom. Every time I step inside the darkened shed of a farm exploiting hens for their eggs, I am filled with a sense of horror that this still exists. Every time I pull a hen from her wire prison, I am filled with a sense of hope that things might change. When I learned that zoning issues prevented us from housing more than 100 animals at a time at our Vacaville rescue & adoption center, I was devastated. Every year, we save 3,000-4,000 hens from farms, rehabilitate them at our shelter, and find them permanent, loving homes. We cannot use our permanent sanctuary for this operation – it needs its own piece of land and infrastructure. This is where you come in. We are committed to saving lives – Rescue Ranch is the ONLY program of its kind in the country. We are looking for a property that can provide housing to between 1,000-2,000 birds temporarily, as well as serving as a small urban sanctuary and education center in the greater Bay Area. We need our friends, family, and supporters to flock together and help us raise $1.5 million dollars. An additional million will be raised from the sale of the Vacaville property. With your help, we can get back to the work of saving lives. 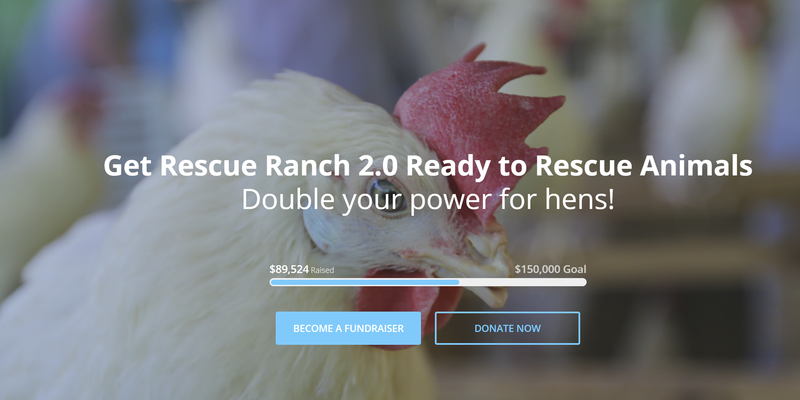 Get your flock together to raise much-needed donations to get Animal Place’s Rescue Ranch (our rescue and adoption program) back on its feet! Due to zoning issues, our current rescue & adoption center needs to relocate, putting ALL large-scale hen rescues on hold until we sell our current property and purchase a new one. Each day that goes by without our new property means a hen is not being liberated from a cage. You can make it possible to get our large scale rescue program back on track and help create an urban sanctuary and education center in the greater Bay Area. We need your help to raise nearly $1.5 million (the remaining $1.5 million is covered by the sale of our existing Vacaville site) to purchase and properly set up a new rescue and adoption center. This includes the cost of buying the property, as well as installing proper fencing, building additional shelters, housing, and barns. Right now, we have a matching gift – you and your friends’ donations will be doubled! Once you get your page started, join our Rescue Ranch 2.0 Facebook group! I am one of your donners and need to get some help on voting yes or no on Prop 12. I helped out on Prop 2 and when I heard about 12 I was very confused. I’ve read up on No on Prop 12 that we should vote no. Even PETA suggests No. Hi Becky! I’m sorry we weren’t able to reply to you before the election. Animal Place did not take a stance on Prop. 12.